Unique Motorcars offers replicas of both the 289 Model and the 427 Model. We have a reputation of providing one of finest kits in the business, and a track record of over twenty years. You will see why this is a fact as you review the kit information presented here. Our most popular kit is the 'Deluxe Pallet Kit'. This consists of a powder coated chassis with all 4 wheel independent suspension, 4 wheel disc brakes, rack & pinion steering, radiator, fuel tank, with brake and fuel lines installed at the factory. 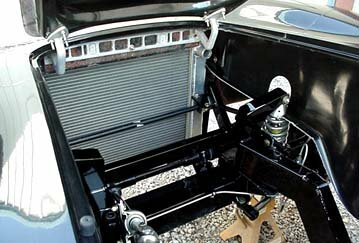 The body is bolted onto the chassis, and all doors, hood and the trunk lid have been installed, hinged and properly fitted. The lights, windshield and dashboard are installed, and the seats leather upholstered, and all pre-cut & edged rug pieces and door panels are finished ready for installation. The roll bar is installed, and the side pipes are bolted in-place. 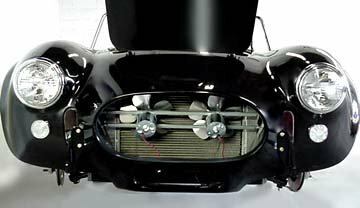 The custom headers for your choice of engine are included with the kit as well. The first two pictures below show you the completeness of the Deluxe Pallet Kit. This is our Deluxe Pallet Kit ready to ship. All of the parts on the floor are packed with the kit. 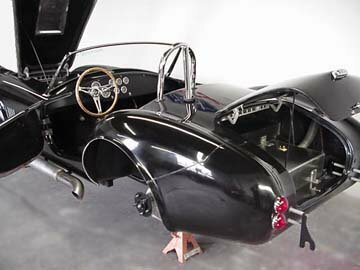 Included in our Deluxe Pallet Kit are the original type steering wheel, leather seats, completed dashboard, door panels, upholstery rug package for the cockpit and trunk, and many other authentic deluxe items. This kit has our standard all 4 wheel independent suspension package. The Jag IRS is standard, as is front suspension. 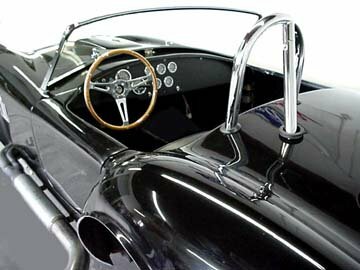 The chrome roll bar is standard on the 427 kit. 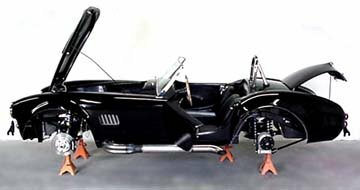 The 289 comes with black powder coated forward braced roll bar, as was the original. 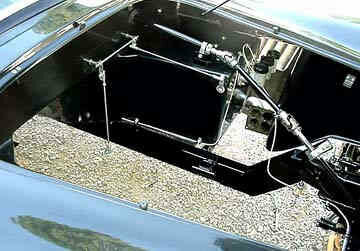 All kits come with the original type rack & pinion steering unit, an aluminum radiator, dual electric fans, 20 Gal. aluminum fuel tank, completed and wired dash assembly with Stewart Warner instruments, original chrome plated brass windshield frame w/glass and a wiper assembly. You can easily finish your kit in about one hundred hours or less. No welding and no fiberglass work or fabrication is required. Just normal, easy auto mechanics. The only tools you will require to finish your dream car are a set of ordinary mechanics hand tools and a standard 3/8" electric drill motor. You are provided both an assembly manual and a wiring manual with easy-to-follow instructions (downloads at the bottom of this page). Completion of your kit requires only that you disassemble the accessories and remove the body for prep and painting. Next, you install your engine, transmission and battery, install the easy wiring loom, and then just reassemble the pre-fitted parts to finish. You are now ready to drive your 289 or 427 Model Replica! That's it! Here is a look under the hood of the Deluxe Pallet Kit. All the brake lines, pedals, hydraulic clutch lines, fluid cylinders and the throttle linkage are installed. Just add the engine and transmission and wire with the included Pro-design wiring harness. A manual is included, of course. The dashboard is already upholstered, instruments installed, and the wiring is complete with a plug-in for the wiring harness. No soldering, no electrical engineering degree needed, just follow the easy directions and plug it together. Here you see inside the cockpit of our completed 427 Kit as shipped to you. Notice the smoothness of the fine gel coat finish and the completed dashboard installed with brand new Stewart Warner instruments. You may specify either the Stewart Warner set (as shown) or the optional Smith instruments. Both were used on the original 427 Model cars. You will notice the side pipes are bolted on the frame. They will fit the custom headers fabricated for your choice of engine, either small block or big block. Now we will take a look at some of the individual parts that make up our Deluxe Pallet kit, starting with the frame. A rectangular tube framework gives a strong basis for our rigid chassis. Then we will review the custom front suspension and the Jag rear suspension. 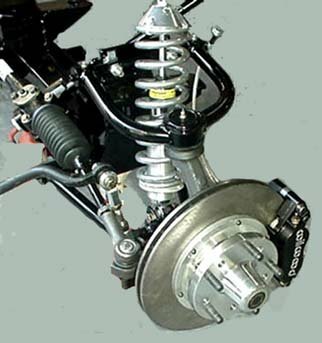 Let's not forget those Wilwood 4 cylinder caliper racing brakes that are standard fare on your Unique Deluxe Pallet Kit. 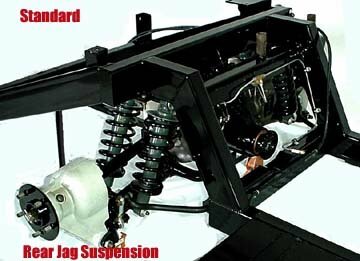 Below Is The Standard Jag Suspension with Optional Anti-Sway Bar. 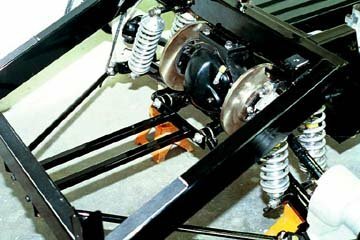 Above Is Our Standard Custom Front Suspension with Wilwood Racing Brakes. 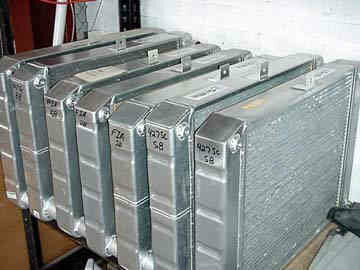 Below Is The Griffin Aluminum Radiator we use on our kits. Now you know why the Deluxe Pallet Kit is the favorite with our customers. The most complete kit you will find, and offered at a very reasonable price. Nothing but the finest quality accessories and custom hardware to be found, anywhere. Below is our factory where all this is made possible. We sincerely hope you will take the virtual factory tour here on our web site. There you will see details of each of our operations. Also, our show room and offices. The door is always open, so don't be a stranger! Or drop by in person and we will shake your hand and give you a demo ride you won't soon forget! Below, we have provided both our Assembly Manual and our Price Sheets for your download. They are in Adobe PDF format. If you do not have Adobe Reader, it is here for your download, also. With your kit you will also receive a complete wiring manual. We hope this look at our kits gives you a good idea of our products. Whether you desire the 289 Model, or the 427 Model model, we have the car for you!